Brandi M. Carlile (born June 1, 1981) is an American three-time Grammy award-winning singer-songwriter and producer whose music spans multiple genres. As of 2018, Carlile has released six studio albums and earned seven Grammy Award nominations, including one for The Firewatcher's Daughter and six for By the Way, I Forgive You. She was the most nominated woman at the 61st Grammy Awards (six) including nominations for Album of the Year (By the Way, I Forgive You), Record of the Year (The Joke) and Song of the Year (The Joke). Carlile dropped out of high school to pursue a career in music, teaching herself piano and guitar. 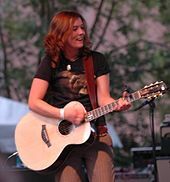 Her debut major label album, Brandi Carlile, was released to critical acclaim yet achieved limited commercial success. Carlile garnered wider recognition with her 2007 single "The Story", from her album of the same name. The Story was awarded gold status in 2017, having sold over 500,000 copies to date. The Firewatcher's Daughter earned her a Grammy nomination for Best Americana Album and peaked at number 9 on the Billboard 200. Carlile has released seven albums, including The Story (2007), Give Up the Ghost (2009), and Live at Benaroya Hall with the Seattle Symphony (2011), the latter reaching number 14 on the Top Rock Albums chart. In May 2017, Carlile released Cover Stories, featuring 14 artists covering tracks from the original The Story album, including Adele, Pearl Jam, and Dolly Parton, it debuted at number 30 on the Billboard 200. Her latest album, By the Way, I Forgive You, was released in February 2018 to critical and commercial acclaim. It debuted at No. 5 on the Billboard 200, her highest charted position to date, and also reached No. 1 on Billboard's Top Rock Albums. Carlile was born on June 1, 1981, in Ravensdale, Washington, United States, a small town 40 miles outside of Seattle. Growing up in the only house for miles, Carlile played in the woods, built forts and played music with her brother Jay and sister Tiffany. Brandi, whose mother is a singer, taught herself to sing when she was a little girl, and she started singing country songs on stage when she was eight years old. She attended Tahoma High School, but later dropped out to pursue her music career. At age eight, Carlile performed Johnny Cash's "Tennessee Flat Top Box" with her mother, Teresa Carlile and began playing the guitar and writing songs at age fifteen. At sixteen, Carlile became a backup singer for an Elvis impersonator. According to Carlile, she was diagnosed with attention-deficit disorder as a teen and dropped out of school to pursue a career in music. After being introduced to the music of Elton John, Carlile taught herself to play piano, and at 17 learned to play the guitar. Carlile began her career performing in Seattle music clubs with the twin brothers Tim and Phil Hanseroth. In the beginning, Columbia Records signed Carlile in 2004 on the strength of songs she had been recording periodically at home. Released in 2005, Carlile showcased those early songs along with newly recorded tracks in the self-titled album Brandi Carlile. The 2006 re-release by Columbia Records included re-recordings of "Throw It All Away" and "What Can I Say". The album peaked at number 80 on Billboard 200 and reached number 1 on US Folk Albums. Her second album The Story was produced by T Bone Burnett. It includes a collaboration with the Indigo Girls on "Cannonball." The album was recorded in an eleven-day-long session with Carlile, the twins (Tim and Phil Hanseroth) and drummer Matt Chamberlain to capture the raw intensity of Carlile's live performances. The crack in Carlile's vocals during the title track, "The Story", came out by accident and was a direct result of the way the album was recorded. "The Story" was featured heavily in General Motors commercials during the 2008 Summer Olympics, leading to increased exposure to her music. "The Story" peaked at No. 5 on the iTunes Music Store's most purchased list. The song was also used in the 2008 commercial for Super Bock and helped the song reach number 1 and the album reach number 4 on the Portuguese charts. "The Story" was featured on the end credits of the romantic drama film The Lucky One. The album peaked at number 41 on Billboard 200 and number 10 on US Rock Albums. In response to the increase in album downloads caused by the adverts in the US (mentioned above), the album saw a 368 percent increase in sales from 1,323 to 6,198. To date the album has currently sold 257,776 copies in the US. The lead single, "The Story", saw an increase in downloads of 28,091 digital copies. "It wasn't until 2007's The Story—her T-Bone Burnett-produced sophomore release—that we realized even half of what we'd been dealt. Nearly a minute into the second song, something about her shifted from promise to absolute certainty as Carlile let loose a hurricane of lung power." wrote Rachael Maddux for Paste magazine. Three songs from her previous (eponymous) album, "Tragedy," "What Can I Say," and "Throw It All Away," were further featured in the TV drama Grey's Anatomy. A special two-hour episode of Grey's Anatomy also featured Carlile's song "Turpentine" during footage of the spin-off, Private Practice. Grey's Anatomy also released a version of the music video for "The Story" with interspersed footage of the show. Actress Sara Ramirez performed her version of Carlile's single "The Story" in the musical episode of the show. Give Up the Ghost was released in 2009 and debuted at No. 26 on the Billboard 200. Produced by Grammy Award-winning producer Rick Rubin, it featured a collaboration with Elton John on the song "Caroline" as well as Amy Ray, drummer Chad Smith and keyboardist Benmont Tench. In 2010, National Geographic Channel in Latin America chose the song "If There Was No You" from the album as a jingle to promote its series "Grandes Migraciones" (Great Migrations). Also that same year, during the 21st GLAAD Media Awards, Carlile was nominated for a GLAAD Media Award for "Outstanding Music Artist" for the album. The album peaked at number 26 on US Billboard 200. Erlewine called Give Up the Ghost one even better than The Story, saying "Give Up the Ghost opens up and breathes, never removes the spotlight from Carlile, who remains a singularly powerful singer/songwriter. When things are Spartan, her voice is haunting and gripping, wrenching out operatic emotions, but Give Up the Ghost trumps The Story because she allows herself to lighten up, to rock again on 'Dreams' ". Carlile's sixth studio album, produced by Dave Cobb By the Way, I Forgive You, was released on February 16, 2018, and was preceded by three tracks: "The Joke", "The Mother", and "Sugartooth". Carlile performed songs from the album on Jimmy Kimmel Live!. She also made a guest appearance on John Prine's album The Tree of Forgiveness. By the Way, I Forgive You went on to become the highest charting album of Carlile's career, reaching number 5 on the Billboard 200. It also reached the number 1 position on the Billboard Top Rock Albums during the same week. The first single from the album, "The Joke", was listed on Former President Barack Obama's year end playlist. The album received critical acclaim from critics, leading Carlile to receive 6 nominations at the 61st Annual Grammy Awards, the most nominations for a female in 2019, including the all-genre Album and Song of the Year categories. She won in three categories: Americana album and both best American roots song and best American roots performance (for “The Joke”). In 2008, Carlile established the Looking Out Foundation, a 501(c)(3) organization, to give financial support to causes that she believes in. The Looking Out Foundation has awarded grants to Reverb, the American Diabetes Association, Honor the Earth, The Bridge School, UNICEF, The Women's Funding Alliance, Doctors Without Borders and the HRC among numerous other organizations. . The Looking Out Foundation has launched numerous grassroots campaigns including Looking Out For The Hungry, The If Project and The Story Campaign. Carlile also donates $1 from every concert ticket sale to the foundation. In January 2010, Carlile's Looking Out Foundation partnered with the Seattle Police Department, the Indigo Girls, and two local Seattle self-defense studios to support the Fight the Fear Campaign. In May 2017, Carlile released Cover Stories, a benefit album featuring songs from her 2007 groundbreaking album, The Story. Troubled by the world's refugee crisis, especially the horrific impact it has on children, Carlile and her Looking Out Foundation chose War Child UK as the beneficiary of the album. Cover Stories features 14 artists, all of whom cover songs from The Story. Highlights are Dolly Parton's cover of "The Story", Pearl Jam's cover of "Again Today", and Adele's cover of "Hiding My Heart". Other artists featured are The Avett Brothers, the Indigo Girls, Kris Kristofferson, Jim James, Margo Price, Old Crow Medicine Show, The Secret Sisters, Anderson East, Shovels & Rope, Torres, Ruby Amanfu, Miranda Lambert, and Chris Stapleton. Former US President Barack Obama wrote the foreword. One hundred percent of the proceeds from album sales go to War Child UK through the Looking Out Foundation and its Story Campaign. War Child UK is an organization dedicated to creating a world where no child is torn apart by war, keeping them safe, giving them an education, and equipping them with skills for the future. In October 2018, Carlile teamed up with Sam Smith to re-imagine the single "Party of One" as a duet with the proceeds going to the ongoing Story Campaign. To date, Carlile has donated over $675,000 to War Child UK through The Story Campaign and sales of her benefit album Cover Stories. In July 2018, Carlile announced the creation of her own music festival, Girls Just Wanna Weekend. This festival will occur in Mexico in January 2019 and will be fronted by all-female musicians such as Indigo Girls, Maren Morris, Margo Price, Patty Griffin, and others. Carlile was inspired to create her own festival after participating in the Cayamo Cruise festival for numerous years. ↑ "Brandi Carlile is already on a Grammys streak with three wins". The Los Angeles Times. 10 February 2019. Retrieved 10 February 2019. ↑ Junior, Chris M. (April 4, 2006). "Medleyville: Q&A: BRANDI CARLILE". Medleyville.us. Retrieved 2011-09-10. ↑ "Artist Brandi Carlile". grammy.com. December 7, 2018. ↑ "Brandi Carlile Album Discography". allmusic.com. February 5, 2019. ↑ "Brandi Carlile On Being the Most-Nominated Woman of the 2019 Grammys: 'I'm Honestly In Such Disbelief'". billboard.com. December 7, 2018. 1 2 Demming, Mark. "Brandi Carlile – Biography | Billboard". billboard.com. Rovi. Retrieved 2015-04-02. ↑ "Grammy nominations: Brandi Carlile makes cut; Kendrick Lamar tops list". The Seattle Times. December 7, 2015. 1 2 Graff, Gary (May 10, 2011). "Brandi Carlile Finishes Fourth Album Before Ray LaMontagne Tour". Billboard. Retrieved September 18, 2011. 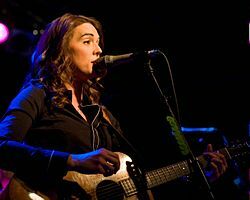 ↑ "Brandi Carlile | Music Biography, Streaming Radio and Discography | AllMusic". AllMusic. Retrieved 2015-04-02. ↑ Aaron, Kace (June 2007). "Brandi Carlile". Harp Magazine. Archived from the original on December 1, 2008. ↑ Cackett, Alan (March 2008). "Brandi Carlile". Maverick. p. 11. ↑ Telling, Gillian (March 24, 2005). "10 Artists to Watch: Brandi Carlile". Rolling Stone. p. 30. ↑ "Close-up: Singer Brandi Carlile". Independent Newspaper. London: Independent.co.uk. April 20, 2008. Archived from the original on April 25, 2008. Retrieved 2011-09-10. ↑ Scanlon, Tom (April 1, 2007). "Rising stars Jesse Sykes and Brandi Carlile thrill hometown". Knight Ridder Tribune Business News. p. 1. ↑ Stephen Thomas Erlewine. 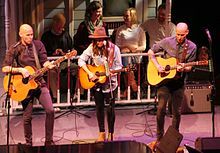 "Brandi Carlile – Brandi Carlile – Songs, Reviews, Credits, Awards – AllMusic". AllMusic. ↑ "Brandi Carlile". Last.fm. Retrieved 2015-04-02. ↑ "About.com: Interview With Brandi Carlile". Folkmusic.about.com. June 14, 2010. Retrieved 2011-09-10. ↑ "Brandi Carlile – The Story (2007 release)". Discogs. Retrieved 2016-03-30. ↑ "Yahoo Music". New.music.yahoo.com. October 14, 2014. Archived from the original on September 10, 2008. Retrieved April 2, 2015. ↑ "Brandi Carlile – The Story". ACharts. Retrieved February 16, 2013. ↑ Stephen Thomas Erlewine. "The Story – Brandi Carlile – Songs, Reviews, Credits, Awards – AllMusic". AllMusic. ↑ "Brandi Carlile to Give Up New Album Oct. 6". Paste. August 18, 2009. Retrieved August 20, 2009. ↑ Abney, Andrea (May 31, 2009). "Young singer works with her idol". San Francisco Chronicle. Hearst Corporation. Retrieved July 7, 2009. ↑ "Brandi Carlile – Chart history". Billboard.com. Retrieved 2015-04-02. 1 2 "21st Annual GLAAD Media Awards – English Language Nominees". Gay & Lesbian Alliance Against Defamation. 2010. Retrieved February 21, 2010. ↑ "Brandi Carlile: Give Up the Ghost". pastemagazine.com. ↑ "Brandi Carlile: On Record". American Songwriter. Retrieved July 9, 2012. ↑ "Safe Haven (2013): Soundtrack and Complete List of Songs – WhatSong Soundtracks". What-song.com. Retrieved 2013-12-04. ↑ ". @BrandiCarlile with an amazing Star Spangled Banner. #NOvsSEA". Seahawks official twitter. Twitter. January 11, 2014. ↑ Hanna Brooks Olsen (January 7, 2014). "The Head and the Heart, Brandi Carlile record love songs for forthcoming Starbucks album". KOMO 4 News. 1 2 3 "Listen To 'The Eye,' A New Song By Brandi Carlile". NPR.org. December 16, 2014. ↑ "The albums we're looking forward to as 2015 arrives – Music – The Boston Globe". BostonGlobe.com. ↑ "10 Albums Worth Looking Forward to in Early 2015". Diffuser.fm. ↑ "Brandi Carlile". Vita.mn. Retrieved 2015-04-02. ↑ "Brandi Carlile Scores Multiple Career Highs on Rock Charts". Billboard.com. Retrieved April 11, 2018. ↑ Bill DeVille (March 2, 2015). "Album Review: Brandi Carlile, 'The Firewatcher's Daughter'". The Current from Minnesota Public Radio. ↑ "Carlile warms to 'Firewatcher's Daughter'". USA TODAY. March 2, 2015. ↑ The Late Show Video – The Avett Brothers and Brandi Carlile: "Keep On The Sunny Side" – David Letterman. CBS.com. Retrieved on 2015-05-18. ↑ Patti Payne (December 8, 2015). "Grammy nominations have Northwest ties: Brandi Carlile, Death Cab for Cutie, Seattle Symphony and more". Puget Sound Business Journal. ↑ Ganz, Jacob (8 February 2019). "John Prine To Release His First Album Of New Songs In 13 Years". NPR. Retrieved 11 April 2018. ↑ "By The Way, I Forgive You Billboard 200 Chart History". Billboard. Retrieved 11 February 2019. ↑ "By The Way, I Forgive You Top Rock Album Chart History". Billboard. Retrieved 11 February 2019. ↑ "Barack Obama's year-end playlist". Variety. 31 December 2017. Retrieved 11 February 2019. ↑ Crowley, Patrick (10 February 2019). "Brandi Carlile Wins Three Grammys During Show Pre-Telecast". Billboard. Retrieved 11 February 2019. ↑ "Teasing the crowd – The Western Front: Features". Westernfrontonline.net. November 22, 2002. Archived from the original on October 3, 2010. Retrieved April 2, 2015. ↑ Powers, Ann (October 17, 2009). "With 'Give Up the Ghost,' Brandi Carlile just may gain the cross-over fans she covets". Latimes.com. Retrieved 2011-09-10. ↑ "About | The Carlile Room | Seattle". Facebook Website Name. Retrieved 2018-09-05. ↑ "Q&A: Brandi Carlile". Medleyville.us. April 4, 2006. Retrieved 2011-09-10. ↑ "Brandi Carlile talks "The Firewatcher's Daughter" and songwriting while happy – AfterEllen". AfterEllen. ↑ "Roots Rocker: Q&A with Brandi Carlile". Richmond Times-Dispatch. ↑ Maple Valley singer-songwriter Brandi Carlile signs to Columbia ... Retrieved 2018-12-12. ↑ Nicole Sipe (October 3, 2009). "Brandi Carlile to 'Give up the Ghost' at the Keswick". Montgomery News. Retrieved 2011-09-10. ↑ Kale, Wendy. "Brandi Carlile's 'Ghost' stories". Colorado Daily. Retrieved 2011-09-10. ↑ Sullivan, Jennifer (December 17, 2009). "Attack inspires women to action". The Seattle Times. ↑ Bernstein, Jonathan (October 17, 2018). "Brandi Carlile Enlists Sam Smith for 'Party of One' duet". Rolling Stone. ↑ "Carlile, Schwarz, school jazz bandleaders honored by City of Music Awards". Seattletimes.nwsource.com. September 20, 2010. Archived from the original on June 29, 2011. Retrieved April 2, 2015. ↑ "Grammy nominations: Brandi Carlile makes cut; Kendrick Lamar tops list". Seattletimes.nwsource.com. December 7, 2015. Retrieved 2015-12-07. ↑ "UK Americana Awards 2019 nominations revealed". Entertainment-focus.com. November 8, 2018. Retrieved February 11, 2019. ↑ "61st GRAMMY Awards: Full Nominees & Winners List". Grammy.com. December 7, 2018. Retrieved February 11, 2019. ↑ Thompson, Rita (July 18, 2018). "Brandi Carlile Confirms Girls Just Wanna Weekend Fest With Maren Morris, Indigo Girls & More: Full Lineup". Billboard. Retrieved 25 July 2018. ↑ Liptak, Carena (July 18, 2018). "Brandi Carlile Plans Girls Just Wanna Weekend Festival With Maren Morris, Margo Price and More". The Boot. Retrieved 25 July 2018.